ISLAMABAD: Raza Ali Abidi, arguably one of the most accomplished broadcasters in South Asia, has called for a focus on airing infotainment so as to reintroduce radio listening in the country. The veteran broadcaster and author of a number of books as well as travelogues cited the fast paced nature of broadcasting itself as the main reason for the decline in popularity of mass media such as radio. Abidi, while speaking at an interactive session “Radio ki kahani” organised by the Allama Iqbal Open University on Thursday, said despite being taken over by various other media outlets, radio had remained resilient through the ages. He suggested that the dynamics and possibilities of broadcasting infotainment-based content should be considered for making radio more palatable and relatable to people across the country. To a question if radio still had the potential to attract large audiences, Abidi said he believed that if around a hundred well-trained youngsters were put to the task of broadcasting carefully selected content-based programmes then radio could thrive in the region once again. “I personally think, given the competing nature of other relative mediums such as the TV and the internet, radio will also take its time to recognise and claim its place eventually,” he added. Abidi said that given the inquisitive nature of young people and their quest for knowledge, he believed that radio would once again become as popular a medium as the television and the internet. During the session, he also spoke about the importance of remaining well-versed in the Urdu language. Abidi said that despite the fact that Urdu transmission had been somewhat tainted with the addition of English language words more recently, the [Urdu] language still thrived in the region, and that it was just a phase, which would pass . 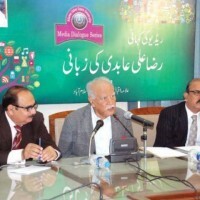 “Urdu underwent many such phases as even Sir Syed had the habit of using a lot of words from English in his writings but that too did not really influence or harm the development and popularity of the language and Urdu broadcasting in general,” he said. AIOU Vice-Chancellor Dr Shahid Siddiqui announced that the university had decided to expand its broadcasting network throughout the country by installing FM boosters in major cities. He said that the FM transmitter boosters would also be installed in the remote areas of the country. Siddiqui also announced that the university’s FM radio live broadcast timings had been extended till late night. Abidi, a journalist and author, is best known for his radio documentaries on the Grand Trunk Road and the Indus River. He was born on 30 November 1936 in Roorkee, India. In November 2013, Abidi was awarded an honourary doctorate by Islamia University of Bahawalpur for his services in the field of broadcasting, journalism and arts. He was also honored as adjunct professor by the same institute.